Below is a streaming video featuring Nickelodeon UK's brand new "This Is Nickelodeon" ident which Nickelodeon UK unveiled on-air on Nickelodeon UK and Ireland and Nickelodeon HD UK on Tuesday 29th May 2012 as part of Nickelodeon UK's recent 2011 brand refresh which Nick UK unveiled on-air on Tuesday 1st November 2011. Nickelodeon UK's brand new "This Is Nickelodeon" Nickelodeon channel Ident (Nickelodeon Station Id) features Nickelodeon Stars from Nickelodeon's most popular shows, including from the cast of "House of Anubis" (Nathalia Ramos (Nina Martin) and Jade Ramsey (Patricia Williamson)), the cast of "Victorious" (Victoria Justice (Tori Vega), Leon Thomas III (Andre Harris), Matt Bennett (Robbie Shapiro), and Ariana Grande (Cat Valentine)), the cast of "iCarly" (Miranda Cosgrove (Carly Shay), Nathan Kress (Freddie Benson), Jerry Trainor (Spencer Shay), Noah Munck (Gibby)) and "Supah Ninjas" (Ryan Potter (Mike Fukunaga), Carlos Knight (Owen Reynolds), and Gracie Dzienny (Amanda McKay)) against brightly coloured animated backgrounds (backdrops). 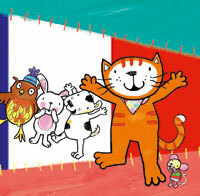 UK-based producer and rights management company Coolabi has secured two new licensing agents for preschool property Poppy Cat, appointing Planeta Junior in France and Asiana Licensing in Korea. The new deals further expand the scope of the IP, which currently has 11 licensees on board in the UK including toyco Golden Bear for plush, plastics and arts and crafts products launching this fall. The Joester Loria Group handles licensing for the brand in North America. Poppy Cat currently airs on EBS in Korea, and other broadcasters include Disney Junior (Spain and Latin America), Al Jazeera Children's Channel, e-vision (UAE), SVT (Sweden), S4C (Wales), EBS (Korea), OKTO (Singapore), Nickelodeon (Australia), TVO and Knowledge Network (Canada), NRK (Norway), RTÉ (Ireland) and CiTV (UK). The series will also launch on the new NBC Kids weekend block in the US from July making it available in more than 110 million US homes. Zodiak Kids has secured a global pre-sale to Nickelodeon, for a series whose budget is thought to be in the region of $9m (£5.7m). 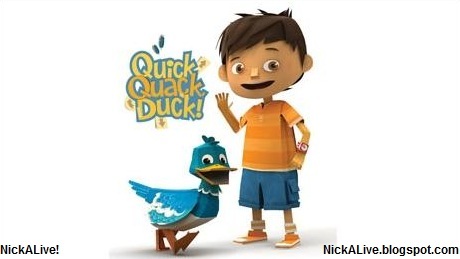 Under the deal, pre-school animated series Quick, Quack, Duck! will air on Nick Jr channels in more than 100 countries around the world from 2013, including the UK and US. The 52 x 11-minute 3D animation is being produced by Zodiak indie The Foundation, in partnership with creator QQD and Korean animation studio High 1 Entertainment. It follows the adventures of an inquisitive seven-year-old boy called Remi and his devoted duck Quack. The duo live in a unique "pop-up world", where they can use tabs, pulls and other devices to trigger popups that create an interactive story. Zodiak Kids senior vice-president of global sales and co-production Karen Vermeulen brokered the deal with Nickelodeon and MTVN Kids and Family Groups senior vice-president of global acquisitions and international programming Jules Borkent. Zodiak MEAA/UK family and kids chief executive Nigel Pickard said a deal “of this scale” would significantly enhance the indie’s relationship with Nick Jr, following the launch of The Foundation’s pre-school series Tickety Toc on the UK channel earlier this year. Quick, Quack, Duck!, which is based on Bafta-winning short film The Happy Duckling, is currently in pre-production. The short's director Gili Dolev co-created the new series with Yvette Kaplan (Ice Age, Beavis & Butthead). Pickard will exec produce with The Foundation's ["Summer In Transylvania"] Vanessa Hill, alongside Kaplan and QQD’s Ronen Shani. Simon Spencer is the showrunner. Global kidcaster Nick Jr has signed an international pre-sale deal for a new animated series from coproducers in the UK, Korea and Israel. Quick Quack Duck! (52x11′) is being produced by Zodiak Media-owned UK prodco The Foundation, alongside Tel Aviv-based format creator QQD Limited and Korean animation studio High 1 Entertainment. The toon will air on all of Nick Jr’s channels worldwide once it is completed. The CGI animated series, co-created by Yvette Kaplin (Ice Age, Beavis & Butthead) and Gili Dolev, follows an inquisitive seven-year-old boy and his duck friend as they adventure through a world in which everything is pop-up. As part of the pre-sale acquisition, Nick Jr will work with The Foundation and QQD on the creative development of the series, which is currently in pre-production. Zodiak Kids, Zodiak Media’s children’s production and distribution arm, brokered the deal and retains worldwide rights to the property. 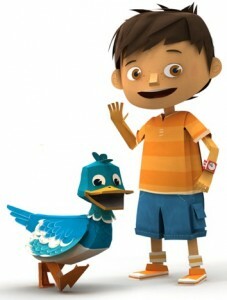 The Foundation's latest preschool series, Tickety Toc, launched earlier this year on Nick Jr in the UK. According to one of Nick Jr. Channel UK and Ireland's new Lower Third banner graphics, to celebrate Queen Elizabeth II's Diamond Jubilee in June 2012, which will be marking 60 years of The Queen's reign on the throne, and the four day Diamond Jubilee Bank Holiday, Nickelodeon UK and Ireland's preschool channel, Nick Jr. Channel UK And Ireland, will premiere and show a very special brand new Diamond Jubilee themed episode of the hugely popular animated pre-school show "Peppa Pig" called "Peppa Pig Meets the Queen" on Bank Holiday Monday 4th June 2012 at 4.00pm. The brand new "Peppa Pig" episode titled "Peppa Pig Meets the Queen" will feature a very special guest star, Her Majesty The Queen, who will not only be playing herself, but will also have the honor of being the first ever human character on "Peppa Pig"! To celebrate Nick Jr. Channel UK premiering the brand new Diamond Jubilee episode Of "Peppa Pig" on 4/6/2012 at 6pm, the official Nick Jr. UK website, NickJr.co.uk, has added a few exclusive "Peppa Pig" downloads (mostly as PDF's) in their "Create With Peppa Pig" section which you can download, print out and colour in to celebrate the Diamond Jubilee "Peppa Pig" style, including Peppa Pig Jubilee Party Invitations, a Peppa Pig Jubilee hat, Peppa Pig Jubilee bunting, a Peppa Pig Union Jack British flag, and a Peppa at the Queen's castle colouring in activity. Wallis and Grommit aren't the only kids' favourites gearing up for the Diamond Jubilee. Peppa Pig is also getting in on the act. A book was published this week titled Peppa Pig Meets the Queen, and the monarch has also made a guest appearance in the TV show. She even dons a pair of wellies and gets stuck into Peppa's favourite activity – jumping in muddy puddles. The fun episode will be screened next month to get children interested in Jubilee activities. Peppa Pig producer Phil Davies said: "As a British production, it's only fitting that Peppa Pig pays tribute to the Queen and we couldn't resist the opportunity to put her into the show. "We hope that everyone enjoys watching the episode as much as we enjoyed making it and that it gets children into the Jubilee party spirit." The Queen is the first human character to appear in the show. In the episode, Peppa's pal Miss Rabbit is selected to receive an award for her hard work and takes her friends along to Buckingham Palace for her once-in-a-lifetime experience. The Queen has made a guest appearance in popular kids' TV show Peppa Pig, which sees her Highness 'jumping up and down in muddy puddles'. In a special episode called Peppa Meets The Queen, the fun-loving pig heads to Buckingham Palace where she meets the royal guest star - who dons her wellies to join Peppa in one of her favourite activities. It will be screened next month in a bid to get children more involved and excited about the upcoming Diamond Jubilee. Peppa Pig producer Phil Davies said: 'As a British production, it's only fitting that Peppa Pig pays tribute to the Queen and we couldn't resist the opportunity to put her into the show. The Queen will be the first human character to be featured in the show. The royal guest star is even seen joining in Peppa's favourite activity, donning her wellies and jumping in muddy puddles – with a tiara on her head. The show - to be screened on television next month - is designed to get young viewers involved in Diamond Jubilee activities and Buckingham Palace say they are ‘aware’ of the programme. In the episode, Peppa's friend, Miss Rabbit, is selected to receive an award for her hard work and brings along her friends to Buckingham Palace for her once-in-a-lifetime experience. The edition will be screened on Channel 5's Milkshake! [AND NICK JR AT 6PM!] on June 4 and released on DVD. Peppa Pig producer Phil Davies said: ‘As a British production, it's only fitting that Peppa Pig pays tribute to the Queen and we couldn't resist the opportunity to put her into the show. Buckingham Palace sources told the Mail that the Queen was ‘aware’ of the cartoon and had been sent an advance copy of the show in which she stars. Remarkably the 86-year-old monarch is surprisingly clued up on children’s television as she frequently watches it when she goes to visit her grand-children, Lady Louise, eight, and four-year-old James, Viscount Severn, whose parents are Prince Edward and the Countess of Wessex. It is understood that she frequently sits down with them to watch CBeebies favourite Justin Fletcher aka Mr Tumble – known to millions of parents up and down the country. The show - to be screened next month - is designed to get young viewers involved in Jubilee activities. You can also buy a Diamond Jubilee/London 2012 Olympics themed children's Peppa Pig Backpack/Rucksack bag, which features Peppa Pig with a heart featuring a Union Jack flag in it. Also, as the diamond jubilee approaches, the Guardian Teacher Network, teachers.guardian.co.uk, has unveiled a "Peppa Pig" resource aimed to help pupils learn about the role of the Queen, and life during her 60 years on the throne, which features an English activity for younger pupils. "Peppa Pig and the Queen" is a caption-writing competition that asks: "When the cartoon character meets her majesty, how might the conversation go?" 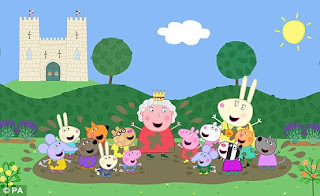 As a stimulus, a still from the programme shows Peppa and the Queen jumping in a big, muddy puddle. Today is the premiere of a brand new special episode of Peppa Pig to celebrate the Queen's Diamond Jubilee. Don't miss it at 4pm today! The brand new special #Jubilee episode of #PeppaPig is starting in 15mins on #NickJrUK. #Dontmissit. Nickelodeon Shuffle from Pixel DNA on Vimeo. Logo, motion graphics bumpers [including 'Next', 'More', and 'Now'], title sequenc & promo graphics created for nickelodeon's new show 'nickelodeon shuffle. ATLANTA, May 23, 2012 /PRNewswire-USNewswire/ -- A new survey of 10,000 teens shows youth understand the responsibility of voting, believe school is vital to achieving career goals, and have a strong desire to be leaders in their communities. The survey, Teens Speak Up: A National Youth Survey on Civic Engagement and Citizenship, was conducted by Boys & Girls Clubs of America (BGCA), in partnership with the Case Foundation and Nickelodeon, in an effort to better understand what teens think about issues ranging from character and civic engagement to the value of an education. The survey builds on BGCA's long history of character development and citizenship efforts, and is the kick-off to the century-old organization's new core program, Be Engaged. Be Engaged is designed to help young people develop good character and inspire them to make a difference, while ensuring Club members are active in their communities; recognize the rights and responsibilities of citizenship; and demonstrate concern for others. The partners will use the survey to ensure youth voice is part of the conversation and to start an ongoing dialogue among those who are involved with engaging America's youth. The survey findings will be particularly relevant in a U.S. presidential election year, where issues that greatly affect youth, such as job creation, education and civic involvement will dominate local and national discussion. The final report released today includes action steps for parents and caregivers, educators and school administrators, community and business leaders, youth development professionals, youth mentors and teens. * 80% of teens polled agree that U.S. citizens have a responsibility to vote. They also agree that every vote in an election can make a difference. * 85% of teens agree that school is important and will help them get a good job and 83% agree that going to college is necessary to achieve career goals. * Nearly all teens polled believe it is important to make a contribution (58.5%), to serve as leaders in their community as teenagers (57.3%), and to address social and community issues (59.8%). * 40% would begin their community contributions at school, and more than 31.5% would begin within their own family. "Our goal is to continue to engage teens, civic leaders, community members and Boys & Girls Club staff in important conversations about these issues to ensure that subsequent generations of America's youth grow to demonstrate greater levels of civic engagement and good character in their communities," said Jim Clark, president and CEO, Boys & Girls of America. At BGCA, civic engagement and character building is an essential element in helping youth become responsible, caring, productive citizens. Teaching critical life skills to all members is a cornerstone of BGCA's mission. Leadership and service groups, such as Keystone Clubs and Torch Clubs, as well as signature recognition programs including Youth of the Year, are just some examples of BGCA's long-time commitment to serving communities and instilling positive values among America's youth. "At the Case Foundation, we believe that citizen-centered approaches to civic engagement, where citizens form solutions and take action together, lead to active, engaged and healthy communities," said Jean Case, CEO of the Case Foundation. "We know from experience that Boys & Girls Clubs of America transforms communities by putting youth first, and we are excited to partner with them to ensure that youth are taking action in their communities today." "At Nickelodeon we feel it is our corporate responsibility to provide our audience with information through The Big Help and Kids Pick the President initiatives to empower them to take the lead in making positive changes in their communities," said Anthony DiCosmo, Vice President, Public Affairs, Nickelodeon Group. "To that end we also connect kids to organizations like the Boys & Girls Clubs of America that provide opportunities for young people to take part in extracurricular opportunities, volunteer and become civically engaged." * The partners developed and commissioned the survey, which was conducted in the summer of 2011. Young people ages 13 to 18 participated. * The survey was created for and - more significantly - conducted by teens in more than 200 communities. * Boys & Girls Club teen leaders served as ambassadors for the Teens Speak Up national survey by polling teens in their neighborhoods, shopping malls, and schools. * The survey process not only challenged Club teens to conduct a major survey in their own communities, it also provided them with the opportunity to give a voice to young people across the country, encouraging peers to take an active, civic role in understanding and addressing community needs. The partners will also hold a national webinar to discuss findings in the coming weeks. The Case Foundation, created by Steve and Jean Case in 1997, invests in people and ideas that can change the world, with the ultimate goal of making giving back a part of everyday life. We create and support initiatives that that leverage new technologies and entrepreneurial approaches to drive innovation in the social sector and encourage individuals to get involved with the communities and causes they care about. For more information, visit www.casefoundation.org and follow the Case Foundation at @casefoundation on Twitter and on Facebook at www.facebook.com/casefoundation. Nickelodeon, now in its 33rd year, is the number-one entertainment brand for kids. It has built a diverse, global business by putting kids first in everything it does. The company includes television programming and production in the United States and around the world, plus consumer products, online, recreation, books and feature films. Nickelodeon's U.S. television network is seen in 100 million households and has been the number-one-rated basic cable network for 17 consecutive years. For more information or artwork, visit http://www.nickpress.com. For more than 100 years, Boys & Girls Clubs of America (GreatFutures.org) has enabled young people most in need to achieve great futures as productive, caring, responsible citizens. Today, nearly 4,000 Boys & Girls Clubs serve some 4 million children and teens through Club membership and community outreach. Clubs are located in cities, towns, public housing and on Native American lands throughout the country, and serve military families in BGCA-affiliated Youth Centers on U.S. military installations worldwide. Clubs provide a safe place, caring adult mentors, fun and friendship, and high-impact youth development programs on a daily basis during critical non-school hours. Priority programs emphasize academic success, good character and citizenship, and healthy lifestyles. In a Harris Survey of alumni, 57 percent said the Club saved their lives. National headquarters are located in Atlanta. Learn more at bgca.org/facebook and bgca.org/twitter. LOS ANGELES, May 24, 2012 /PRNewswire/ -- Licensing Expo 2012 (www.licensingexpo.com), the licensing industry's largest annual event, will be held next month June 12-14, at Mandalay Bay Convention Center in Las Vegas. For more than 30 years, Licensing Expo has brought together retailers, manufacturers, brand owners and marketers looking to find new intellectual properties and brands, experience the latest trends, and initiate deals that will drive an estimated $200 billion in retail sales expected this year. Kathy Ireland, CEO and chief designer of kathy ireland Worldwide, will deliver the keynote address on Tuesday, June 12, at 8:30 a.m., to share how she turned her name into a $2 billion a year licensing empire. As the popularity of licensed products continues to grow globally, both retailers and licensors are expanding their licensing initiatives to capitalize on this compelling industry. Whether expanding a brand, opening new markets or driving revenue, licensing has become a key growth strategy for businesses of all sizes. * Entertainment: BBC, Cartoon Network, CBS, Disney, DreamWorks, Lucasfilm, Paramount, Power Rangers, SeaWorld, Sony, Twentieth Century Fox, Universal Studios, Warner Bros. Licensing Expo also offers attendees more than 30 free classes through Licensing University, which teaches a variety of topics including retailing strategies, the legal side of licensing and extending brands globally. Hosting attendees from more than 90 countries, with 600 licensing agents, the Licensing Expo gives attendees the ability to spot trends, build strategic partnerships, secure promotional tie-ins and connect with properties worldwide. For more Licensing Expo news and live updates from the show, follow @LicensingExpo or like www.facebook.com/licensinginternationalexpo, and download the License '12 smartphone app. Licensing Expo (www.licensingexpo.com) is the licensing industry's largest annual event. A trade show for leveraging properties and brand equity to develop merchandise, Licensing Expo attracts more than 400 exhibitors representing more than 5000 brands and properties in entertainment; sports; fashion and apparel; publishing; art and design; automotive; animation/anime; home and housewares; and lifestyle. Exhibitors include Fortune 500 consumer brands, film studios, publishing houses and other creative agencies. Attendees from more than 80 countries represent the world's leading retailers, licensees, manufacturers, distributors and licensing agents. The show is owned and organized by Advanstar Communications, Inc., is sponsored by the International Licensing Industry Merchandisers' Association (LIMA), and is affiliated with License! Global magazine. Kids Week has revealed a record line-up of 38 shows offering free tickets and activities for children as part of the Kids Week initiative from 1 until 31 August 2012, in an announcement highly anticipated by children and families across London and the UK. Now in its 15th year and run by the Society of London Theatre, Kids Week is all about encouraging young people to experience the magic of live theatre. During Kids Week a child aged 16 or under can go free to participating shows when accompanied by an adult paying full price. Up to two extra children’s tickets can be purchased at half price. The shows taking part in Kids Week are: The 39 Steps, Billy Elliot The Musical, Blood Brothers, Carousel, Chariots Of Fire, Chicago, Disney's The Lion King, The Doctor's Dilemma, Dreamboats and Petticoats, Ghost The Musical, Horrible Histories - Barmy Britain, Jersey Boys, Les Misérables, Mamma Mia!, Matilda the Musical, A Midsummer Night's Dream, The Mousetrap, Nickelodeon's Dora The Explorer, One Man Two Guvnors, The Phantom Of The Opera, Ragtime The Musical, Reduced Shakespeare Company, Rock Of Ages, Shrek The Musical, Singin' In The Rain, Spamalot, Stomp, Sweeney Todd, The Tiger Who Came To Tea, Timon Of Athens, Thriller Live, Top Hat, War Horse, We Will Rock You, Wicked, The Wizard Of Oz, The Woman In Black and Yes, Prime Minister (all shows subject to availability; certain shows have very limited availability; age suitability guidance on the Kids Week website). Kids Week has a fantastic range of free activities and events, many new and others back by popular demand! Take part in a Tigerlympics Tea Party, become a Munchkin in the Merry Old Land of Oz, join Michael Ball in a Sweeney Todd Q&A, learn more about Disney’s The Lion King’s award-winning masks and puppets, bring your brolly to a Singin’ in the Rain dance class or head into Terrible Tudor times at a Horrible Histories workshop. Tickets for Kids Week, which will run for the whole of August, go on sale on Tuesday 12 June at www.kidsweek.co.uk and by telephone 0844 248 5151 (no booking or postage fees apply). To join in the latest Kids Week discussions and hear the news, join more than 7,500 Kids Week fans on Facebook (www.facebook.com/KidsWeekLondon) and follow Kids Week on Twitter (www.twitter.com/kidsweek). This year’s Kids Week is part of the London 2012 Festival, the spectacular 12-week nationwide celebration running from 21 June until 9 September 2012 bringing together leading artists from across the world with the very best from the UK. According to Amazon.co.uk, Nickelodeon Consumer Products UK and Paramount Home Entertainment will be releasing Nickelodeon's "Fanboy & Chum Chum: Brain Freeze" DVD in the UK (Region 2/PAL format) on Monday 23rd July 2012. Nickelodeon's "Fanboy and Chum Chum: Brain Freeze" DVD will feature seven episodes from the popular original animated Nickelodeon show ('Nicktoon') "Fanboy & Chum Chum", plus a bonus episode from "SpongeBob SquarePants". This title will be released on July 23, 2012. Fanboy and Chum Chum will do anything for a Frosty Freezy Freeze! Get brain freeze along with them in these fantastic, frostentatious adventures. You can pre-order the brand new "Fanboy and Chum Chum: Brain Freeze" DVD on Play.com for £7.99 with free delivery. To celebrate Nickelodeon Consumer Products UK and Paramount Home Entertainment releasing the brand new "Fanboy & Chum Chum" DVD in the UK (Region 2), the official Nickelodeon UK and Ireland website, Nick.co.uk, has launched an "Fanboy and Chum Chum" competition where ten viewers of Nickelodeon UK and Ireland & Nicktoons UK and Ireland and fans of the popular animated original Nickelodeon show ("Nicktoon") "Fanboy & Chum Chum" could win some great "Fanboy & Chum Chum" prizes - a copy of Nickelodeon's brand new "Fanboy and Chum Chum" DVD, with also features a bonus episode of SpongeBob SquarePants, and a exclusive "Fanboy and Chum Chum" T-Shirt! The brand new DVD and a T-Shirt! Calling all Fanboy & Chum Chum fans! What is the colour of Fanboy's cape? Closing date for entries is 10am on Monday 11th June 2012. Entrants must be aged between 5 and 15 years old to enter. There are 10 prizes of a DVD and t-shirt to be won. You can enter Nickelodeon UK's exclusive "Fanboy & Chum Chum" competition here on the official Nickelodeon UK website at Nick.co.uk. You can also buy the brand new "Fanboy & Chum Chum" DVD, which is rated U (Universal - suitable for all) and released in the UK on Monday 28 May 2012, on the Nickelodeon Store Amazon.co.uk and on Play.com for £7.99. Both Amazon UK and Play.com offer free delivery options. Moving the BBC’s children's programmes off its terrestrial channels and on to digital networks will not harm programme production but low budgets could, writes Jesse Whittock. Earlier this month, the BBC’s governing body the BBC Trust approved plans to shift children’s programming off flagship channels BBC1 and BBC2. The predictable reaction from the UK press was to wail about tradition being ignored and iconic kids’ shows like Blue Peter being sidelined. But there’s much more to this story than history – in fact, the defining moments of BBC Children’s future are yet to come. Quite how moving such content to diginets CBBC and CBeebies equates to the end of family viewing, as former Blue Peter presenter Valerie Singleton told The Daily Telegraph last week, is a mystery to me. Equally baffling is why parent’s group ParentsOutloud claimed the BBC is “ghettoising” kids’ content. It’s not – the BBC is simply changing with the times. Taking children’s content away from the Beeb’s flagship channels is justified because pretty much the entire UK now has digital terrestrial television, or will have it by the end of 2012. And if the YouView platform ever materialises, it will be even easier to watch kids’ programmes. In addition, these days British children commonly have access to iPhones and tablets. They don’t care about Blue Peter’s 54-year run on BBC1, whether you do or not. That's the reality. The next 18 months will be pivotal for both CBeebies and CBBC, where children’s content will ultimately be aired exclusively. It’s a period that could potentially define both channels, and this should be welcomed. The early effects of the BBC’s Delivering Quality First cost-saving initiative, which will chop 20% of the pubcaster’s budget by 2017, are starting to be felt and in the future the key factor will be the quality of the programmes the pair commissions and produces in-house. CBBC – which is still to reveal whether current head of acquisitions and drama development Sarah Muller will replace outgoing controller Damian Kavanagh as expected – gets the lion’s share of the available cash to create expensive drama and documentary series and strands. CBeebies, which is the better performing of the two channels, has to make do with far less. The BBC’s annual report for 2010/11 showed CBBC had a content budget of £78.3m (US$122.8m) last year and CBeebies £28.5m. Adding distribution and infrastructure spending, these figures increased to £99.3m and £38.7m, respectively. The idea that CBBC vacuums up most of the available money has riled some commentators, such as UK media writer Maggie Brown in this article for The Guardian. “It is barely discussed outside of the cloistered world of children’s TV production, but kids’ channel CBeebies, wildly popular with parents of young children, is poorly funded to the point of shabby mistreatment,” she wrote. And while Benbow would surely love to swap CBeebies’ budget for CBBC's, her channel is managing to create some high-quality programmes regardless, largely thanks to independent producers and the global coproduction market. Recent examples include boys-skewing action toon Tree Fu Tom, created with FremantleMedia Enterprises, which has been a ratings success; and 26-part dress-up series Let’s Play, which Zodiak Media-owned prodco The Foundation is producing for a late-2012 transmission. Sure, this will often mean the Beeb’s commercial arm, BBC Worldwide, doesn’t get its hands on potentially lucrative distribution and other ancillary rights (or at least has to share them), but the priority is to create series that are long-lasting and either educational or encourge physical activity. Tree Fu Tom and Let’s Play do so and CBeebies is rightly making a lot of noise about them. A critical period for BBC kids’ content is coming but resisting change and complaining about the end of traditions is not the way forward. According to Nickelodeon UK's brand new "It's time to mix it up with Nickelodeon Shuffle!" promo/trailer (below with transcript), to celebrate the June 2012 school half term holiday, Nickelodeon UK will be bringing their weekend programming block "Nickelodeon Shuffle" to weekday mornings, where every weekday morning from Monday 4th June 2012 and Friday 8th June 2012, Nickelodeon UK will be showing back-to-back episodes of favourite Nickelodeon shows, including "Big Time Rush", "Victorious", "iCarly", and "Life With Boys" every weekday morning between 9.00am and 12.00pm on Nickelodeon UK and Ireland and Nickelodeon HD UK (repeated between 10.00am and 1.00pm on Nickelodeon UK's plus one (+1) timeshift channel Nick Replay UK). It's time to mix it up with Nickelodeon Shuffle! Catch your favourite shows back to back with Nickelodeon Shuffle, all next week from 9am to 12pm on Nickelodeon! Half term!! What will you guys be getting up to with your time off?! Tess is about to get super competitive in today's episode of #LIFEWITHBOYS at 10.30! I [heart symbol] half term -what are you up to today? I wouldn't want fish nibbling on my feet like in @Victorious, would you? Gross! Will Carly and co. keep Nora behind bars? Can't wait to find out! I love the @iCarly guest appearances!#iMeetTheFirstLady - whats your fave star appearance? According to Nickelodeon UK's brand new "Choo Choo Time On Nick Jr. 2" promo/trailer (transcript below), to celebrate the June 2012 school half term holiday, Nickelodeon UK and Ireland's preschool channel, Nick Jr. 2, will launch a brand new programming stunt called "Choo Choo Time", where every weekday between Monday 4th June 2012 and Friday 8th June 2012, Nick Jr. 2 will be taking Nick Junior 2 viewers on railway adventures by showing back-to-back episodes of the popular Nick Jr. shows "Thomas and Friends" ("Thomas The Tank Engine") and "Dinosaur Train" every afternoon between 12.00pm and 4.00pm. This half term, it's Choo Choo Time on Nick Jr. 2! The Troodons are teaming up with Thomas and Friends. Back to back episodes of Dinosaur Train and Thomas and Friends. Just the ticket for afternoon adventures! All aboard for Choo Choo Time! Everyday next week from 12-4, on Nick Jr 2! Nickelodeon UK Starts Filming "Camp Orange 2012"
According to Nickelodeon UK and Ireland presenter and voice-over artist Anna Williamson and Nickelodeon UK's Managing Director, Tina McCann, on their official Twitter profile pages, Nickelodeon UK today (Monday 28th May 2012) started to film the second series of "Camp Orange UK", "Camp Orange 2012", Nickelodeon UK's version of the children's adventure reality television show for best friends. (Nickelodeon UK and Ireland presenter Jamie Rickers) @JamieRickersGWR: Why have I JUST got this. Great day thanks. Kids are fantastic. New twist works well x - 8.07pm Monday 28th May 2012. Below is a Nickelodeon "Teenage Mutant Ninja Turtles" news articles which feature information, photographs, and details about Nickelodeon's brand new CGI-animated "Teenage Mutant Ninja Turtles" television series which were revealed by Nickelodeon's Senior Vice President for Current Animation, Rich Magallanes, and Kevin Eastman, the co-creator of "Teenage Mutant Ninja Turtles", at Nickelodeon's exclusive "Teenage Mutant Ninja Turtles" presentation at the MCM Expo London Comic Con 2012 on Saturday 26th May 2012, which featured a exclusive sneak peek showing of Nickelodeon's brand new CGI-animated "Teenage Mutant Ninja Turtles" television show, and a exclusive Q&A session with Rich Magallanes and Kevin Eastman. The TMNT news articles below also feature reviews about Nickelodeon's brand new "Teenage Mutant Ninja Turtles" animated show, including about the characters (Leonardo, Raphael, Donatello and Michelangelo) and animation techniques used. On what was a blisteringly hot and beautifully bright day near the Thames, it seems almost apt that an even bigger wave of resplendent costumes and characters appeared for day two of the London MCM Comic Con. Following a rather teasing first day at the Excel Centre, today brought no shortage of guests, presentations and fantastic things to get excited about. Starting the day with another look around the famous stalls and browsing any newer additions to the floor, I soon found myself back at the Gamespot UK area where a particular game of interest was set for a walkthrough. That game was first-person shooter Aliens: Colonial Marines. Quizzed about the upcoming title, now unfortunately delayed until an early 2013 release, Brian Berneson from Gearbox was on hand. Explaining that the game was heavily influenced by just the Aliens film in the famous saga, there was a fabulous show of graphics in store for fans, a trailer compiled with simply gameplay footage representing this. Aside from impressive graphics, it was clear that the whole Alien feel was to be maintained through a truly atmospheric and claustrophobic setting players would get accustomed with. At quick glance, this could well turn out to be the best Alien-based game available yet. Moving swiftly on from the gaming world, I briskly stepped into an arena where excitement levels were at a peak and one of, if not the, most exciting presentations of the whole weekend was set to begin. Bringing back childhood memories personally, and I’m sure for a lot of you, the Teenage Mutant Ninja Turtles are set to return on Nickelodeon in the near future and two men involved in the reboot were present to show us more. Co-creator Kevin Eastman and Senior Vice President, Nickelodeon Animation, Current Series Rich Magallanes appeared as excited as the audience when their presentation began and rightly so, the project is one to be admired. Explaining that while they wanted to stay faithful to the original comics and TV series, a change was required and the move into CG-Anime was a necessary one. Confirming that the turtles themselves would be very much teenage in their actions and nature, the foursome looked brilliant and each had their very own unique looks as well as personalities. Throwing into the mix a very diverse April O'Neill (also now a teenager to fit in with the age of our turtles), Magallanes also confirmed the return of infamous villains Shredder and the alien race The Kraang. 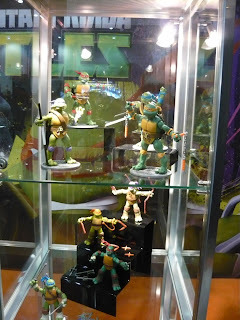 The Turtles, of course, wouldn’t be complete without their sensei either, and also styled into a new look was Splinter, who has been made slightly taller than in the series’ predecessor and this time around younger, therefore allowing for more action in regards to the character. Fortunately, we were treated to some world–exclusive footage of the new show and I must say, even as a 23-year-old man, it’s a show that has to be checked out. Fluid animation and some top-notch voice acting from the likes of Jason Biggs and Sean Astin, the new series of Teenage Mutant Ninja Turtles is just what the kids of today need and will also provide a nice touch of nostalgia for the older viewers. Incidentally, Eastman also gave an update on the much maligned Michael Bay film version and gave some comforting messages. Having been working in collaboration with Bay on the film, he stated that the criticism was somewhat unfair and that early signs were extremely positive and exciting. Watch this space on that one. From TV to film now, and a big British name was centre stage following the television buzz, in the form of urban scene legend Noel Clarke, along with director Johannes Roberts, promoting their June 29th release, Storage 24. Dubbed as a sci-fi/horror, the gentlemen started proceedings with a trailer giving us an idea of what to expect and, although visually promising, even Clarke admitted it didn’t quite do the film justice. Despite a trailer lacking some oomph, the men proceeded to explain the basis of the story and also went on to talk about their influences and how the project came to fruition. Beginning as a first draft script by Clarke, Storage 24 eventually found its way to director Roberts, who closely collaborated with the British star and thrust him into the main role for what was to be a survival in a storage facility with an alien running loose. After talking through the creation process, the pair both could not hide their excitement in revealing that the finale was to be ‘groundbreaking’ and ‘iconic’. In describing the film as mild horror rather than full-blown genre-specific, Roberts admitted that all films containing aliens had one aspiring film, Alien. With that, we were shown an exclusive clip of the film giving a look at the alien in the film and, containing a mix of suit and CG, considering the film is of a low budget category, commendation must be given to those involved as the creature hits realism spot on. After the clip it was the audiences’ turn for posing questions and a variety came the way of Clarke inevitably. When asked about both his role in Star Trek 2 and a possible return to Doctor Who for the 50th anniversary, he revealed nothing and also quashed any thoughts of a follow-up to Adulthood, using Spider-Man 3 as an example of threequel gone wrong. Finishing the Q&A with a nod to the pair working together again, Clarke and Roberts exited what was a fine showing of a promising British film. Of course, Comic Con would not be the same without some cosplay action, and in both the sunshine and the crowded exhibition centre I waded through the crowds in the hope of gaining some pictures for those who love to see just what characters have been strolling the arena so far. Enjoy them below and check back tomorrow for a round-up of the final day (including a special Danny DeVito feature). An unknown from Cheshire will be the centre of attention tonight as some of the nation's most famous faces from the small screen gather for the TV Baftas. The unassuming star is likely to get walked on by the likes of Benedict Cumberbatch, Emilia Fox, Miranda Hart and Dominic West. But that is as it should be because, you see, the focus of camera lenses at the British Academy Television Awards will be a 45-metre strip of red carpet from the Plantation Rug Company in Stockport. As has become obligatory for awards ceremonies, actors will parade down the scarlet sward ahead of the event at the Royal Festival Hall in London. Last week, Brad Pitt and Kristen Stewart were joined by the pop stars Kylie Minogue and Cheryl Cole on the red carpet at the Cannes Film Festival, which ends this evening. And around the world, from awards ceremonies to film premieres, VIP arrivals, state visits and royal events, a rug of red (or occasionally some other colour) has become a must. Here, The Independent on Sunday weaves the story, alphabetically, of the red carpet. Nickelodeon's Kid's Choice Awards and the Academy of Country Music Awards think the future of red carpets is, well, orange. Both use orange carpets. While the organisers probably like standing out from the crowded award ceremony scene, fashion-conscious stars will quietly fret over trying to co-ordinate their outfits with the bright hue. You can ready The Independent on Sunday's full article on the secret life of the red carpet here on the official The Independent website, Independent.co.uk. 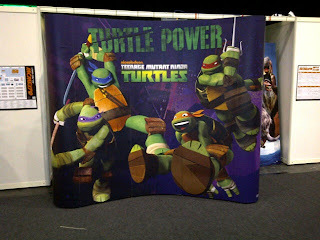 Attendees were ushered into the largest of MCM's screening rooms to find some gifts waiting for them- every chair had a coloured bandana (in a choice of the 4 iconic Turtles colours), a [Teenage Mutant Ninja Turtles] branded bottle of drinking water and a copy of issue #4 of IDW's TMNT comic book. Cameras prowled the vast room, eagerly taking footage of the overflowing fan enthusiasm. Eventually this energy was collectively harnessed as we were all urged to don our bandanas and emit cries of 'I love being a turtle!'. After this, comic book writer and artist Nick Roche took to the stage to introduce Nickelodeon's Rich Magallanes (whose credits with the network include Rugrats, Fairly OddParents and SpongeBob SquarePants) and TMNT co-creator Kevin Eastman. The pair explained that they felt the long term success of the franchise was down to the characters. With this new series, they wanted to deepen that, particularly exploring the Turtles first taste of life topside and making them act like real teenagers, giving them clear room to learn and develop as both heroes and characters. The visual style of the series was described as 'CG meets anime', attempting to combine the two without simply repeating the familiar visual styles of both. The show will be an action comedy with very specific attention paid to the martial arts action. The storyboard artists studied real practicing martial arts masters and attempted to transition as much of this into the animation as possible. This also extends to attempts to really reinforce the 'ninja' element of the heroes with more active use of stealth and cunning. A brief introduction to the core cast established their starting points. Leonardo (Jason Biggs) will be a leader whose enthusiasm outclasses his current ability, taking guidance from Splinter and a Captain Kirk-wannabe TV character. Raphael (Sean Astin) was described as a 'pitbull with knives' who will retain his famous rivalry with Leo along with his hotheadedness. Donatello (Rob Paulsen) continues as the team's science whiz but now also carries a crush on April which is continuously made fun of by his brothers. His character design also boasts a gap between his teeth which we were told ties into a drive to make each of the Turtles unique both in terms of character and design, with small details such as this and a scar for Raph hinting at unseen escapades. Michelangelo (Greg Cipes) is still a joker but brings with it a unique viewpoint which offers solutions that escape his brothers. We were informed that many of the staff of the new show were fans with great respect for the franchise's history and that in the earliest stages of development, fans had been invited to the studio to ensure Nickelodeon understood the long term fans' feelings. At the same time a consistent effort will be made to bring forth new ideas and make the series something unique for a new generation of fans, not simply repeating ideas that have already been done before. A short preview was then shown which depicted Leo, Raph and Don using Mikey as bait for a killer robot, only to end with him frantically running back to his brothers whilst being chased by heat seeking missiles. In the resulting carnage, he finds comfort in dangling from a beam in clear view of a pizza parlour. Following this we were introduced to the three other main regulars. Splinter will be 'less Yoda', being aged down slightly to make him more of a physical equal to the Shredder and more directly involved in his pupil's training. However he will still be a fountain of knowledge that Leo in particular looks up to. April has been made younger, with the somewhat joking concern that a 30 year old hanging out with four teenagers felt off. This will serve to make her more directly relatable to the Turtles, being an independent rebel who isn't afraid to take action when needed. The Footclan soldiers will now wear more traditional ninja garb and also frequently use shadows and stealth techniques. The intent is to make them a true force to be reckoned with, which also holds true for their master, Shredder. Described as 'the baddest of the bad', he'll be causing trouble for the mutant family from the very first episode. The role will be brought to life by Kevin Michael Richardson, though Eastman joked he'd hoped to get Bobcat Goldthwait. The final character reveal was the alien race 'The Kraang', the series fusion of the iconic 80's bad guy and the more traditional Utrom aliens. Only able to speak through their robotic bodies, they will have an agenda to colonise Earth that is linked to the mutagen which transformed the Turtles and Splinter. 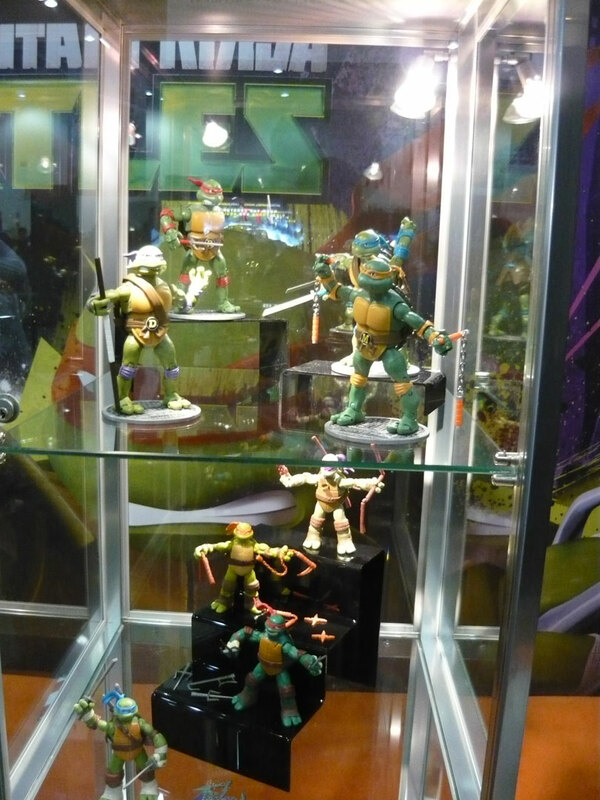 Eastman highlighted that visually, the robot design draws directly from the original TMNT #3 comic book. We were then treated to the exclusive of the panel- a brand new world premiere trailer. Things start with the brothers darting across rooftops of NYC at night before settling in an alley. Mikey is goofing off playing kick the can, which causes his three brothers to angrily shush him in a Teen Titans-reminiscent sight gag. A group of Foot soldiers emerge from the shadows, and Leo's cocky quip is met by several more. The Turtles still emerge triumphant and their demand for a better challenge is met with the sinister mocking laughter of the Shredder. Focus then switched to an encounter with a Kraang, visibly freaking the brothers out before Mikey starts beating it unconscious in another comedy sight gag. Waving his trophy around, he berates the other three for not believing him such a creature existed before it wakes up and latches onto his face, leading Raph to quip, “How can you be proven right and still look stupid?” While the earlier preview had received a positive reaction, the response to the new one was certainly higher, with the audience awed at the action and getting a good laugh from the comedy. We were then introduced to some of the vehicles Don will make for the team from a mix of New York garbage and obtained Kraang technology. The first of these was the Stealth Cycle, a three wheeled motorbike with a body covering shield for stealth action. 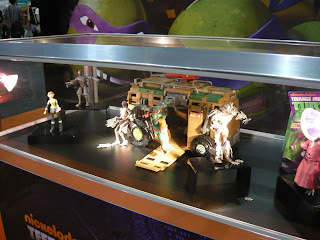 The second was the Shellraiser, the series take on the iconic Turtle Van. Made out of an abandoned subway car with heavy armour applied, it will be able to switch between running on tracks and running on the streets. A brief look at some of the locations was next, underscoring how the staff wants districts of NYC to feel different from one another. When the floor was opened to questions, many involved the chances of other characters returning. 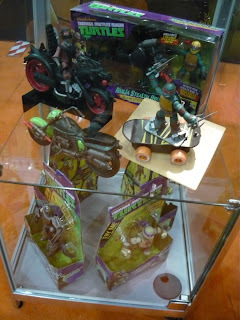 Leatherhead, Baxter Stockman, and Karai will all appear in the series, and the staff is trying to find a way to use Casey Jones without having to lose the heart of the character. The popular Bebop and Rocksteady will not appear, but the show will offer its own take on that concept. Rich informed us that the show doesn't just want to do back to back character debut episodes, exploring the characters first and involving new characters when it makes sense in the story. This extends to introducing brand new characters to the mythos. When asked about the chances of some of the more exotic arcs from the comics being adapted, Eastman felt this highlighted the difference between then and now. When he and Peter Laird were creating the original comics, they were free to do whatever entertained them at the time, which invited pop culture homages. When producing a TV show now, more concern has to be taken to planning the story out and not rushing too quickly through ideas. Concepts like the Triceratons may be explored in time but for now the show will focus on the Turtles clashes with the Shredder as they learn of the world above. The soundtrack is currently being composed and will play a key role in selling New York as a living city, using different types including drum and bass. When asked about the opening theme and if we'd hear anything of the iconic 80's version, a subtle hint implied the new opening might be a remix of it. On a similar note it was revealed that Mikey's new catchphrase will be 'Booyakasha!' When Rich asked if fans would like to see a return of the original 'Cowabunga!' at some point, there was strong support. 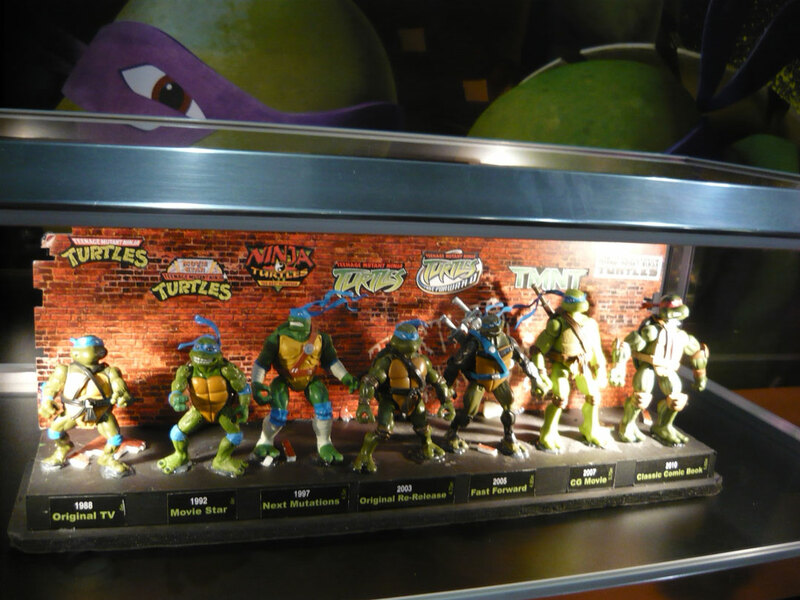 When asked why pizza was chosen as the Turtles favourite food, Eastman said it emerged from the limited diet he and Laird could afford at the time. A few people asked Eastman for his response to the upcoming Michael Bay movie and most prominently the director's plan to make the Turtles aliens instead of mutants. Eastman asked fans to be patient and said that between the film, TV show, and IDW comic fans would receive 3 different but respectful reboots. The last question came from an enthusiastic little boy who wanted to know when the new toys will be released. Expect to see them this August for America, and January 2013 for the UK. Upon leaving the theatre, samples of these new toys were setup in display cases for public viewing. In all, it was a noteworthy presentation which shows Nickelodeon are concerned with treating this property with respect. Fan feedback was the clear goal of the screening and clearly not just for the larger bases like America but smaller ones like the UK. I have to admit that when news first broke that Nick were planning to reboot the series so soon after the 4Kids version I questioned if it would work. Having now seen this, I think it's clear they plan to do something unique and respectful that will both please existing fans and more importantly capture the imaginations of a whole new generation. Nickelodeon UK To Show Two Brand New "Big Time Rush" Episodes On 2nd June 2012 - "Big Time Move" And "Big Time Interview"
According to Nickelodeon UK's brand new "Brand New Big Time Rush Is Going Back To Back" promo/trailer (below with a transcript), Nickelodeon UK and Ireland and Nickelodeon HD UK will be premiering and showing TWO brand new episodes of the hit Nickelodeon live action show "Big Time Rush" back-to-back on Saturday 2nd June 2012. The first brand new episode of BTR Nick UK will premiere on Saturday 2nd June 2012 will be the brand new "Big Time Rush" episode "Big Time Move" at 5.30pm (repeated one hour later at 6.30pm on Nick UK's plus one (+1) timeshift channel, Nick Replay UK), in which the Big Time Rush guys have a fight and move out. James ends up squatting in a retiree's apartment, Logan moves to a place by the water, Carlos builds a cardboard house, and Kendall must fix things (Guest Starring: Erin Sanders as Camille, Malese Jow as Lucy Stone, Savannah Jayde as Jennifer 3, David "Gruber" Allen as therapist, David Anthony Higgins as Mr. Bitters and Challen Cates as Mrs. Knight; Song featured: "All Over Again"). The second brand new episode of "Big Time Rush" that Nick UK will premiere on Saturday 2nd June 2012 will be the brand new "Big Time Rush" episode "Big Time Interview" at 6.00pm (repeated one hour later at 7.00pm on Nick UK's plus one (+1) timeshift channel, Nick Replay UK), in which the Big Time Rush boys sit down for a major Hollywood interview, where they look back to their greatest moments, answer revealing questions about their life inside and outside of Big Time Rush, and reveal pictures and secrets (Guest Starring: Michelle Madison as herself and Challen Cates as Mrs. Knight; Songs featured: "If I Ruled the World", "Big Time Rush", "Paralyzed", "Superstar", "Blow Your Speakers", "Worldwide"). Brand new Big Time Rush is going Back To Back! And these four happy campers are starting to get cabin fever. Then, get ready for Big Time Gossip, as all the boys secrets will be revealed in Big Time Interview! [Michelle Madison: Coming up later. Don't miss brand new back to back Big Time Rush, next Sarturday at 5.30pm, only on Nickelodeon! Were really spoiling you #UKRushers today - not 1 but TWO brand new eps of @BigTimeRush from 5.30!! You asked for more and you got it!! ANOTHER new ep of @BigTimeRush coming up right now! #UKRushers. The new series of Kung Fu Panda starts on Saturday, June 9. Tune in to find out what Po has been up to! Does he have an evil twin??? Find out in "Bad Po". And will he be humiliated in "Hall of Lame"? 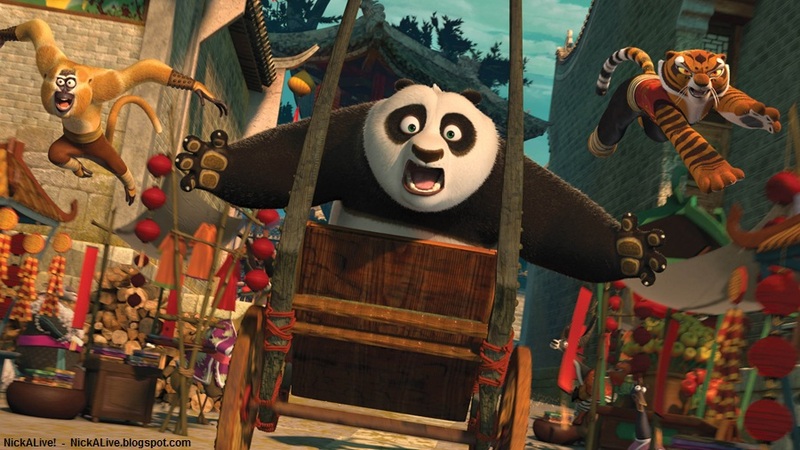 Brand new episodes of Kung Fu Panda are coming to Nickelodeon! 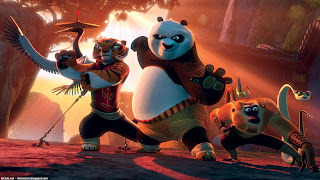 Kick it with Po and the Furious Five! New episodes so AWESOME you won't believe your eyes! Brand new episodes of #DinosaurTrain are on all this week on #NickJrUK. Are your little ones excited?? According to the official Nickelodeon Suites Resort website, NickHotel.com, to celebrate summer 2012 at the Nick Hotel, the Nickelodeon Suites Resort in Orlando, Florida, USA have bought back the iconic Classic Nickelodeon game show "Double Dare", which lucky guests staying and visiting the the Nick Hotel this summer (2012) will be able participate in! To celebrate this Classic Nickelodeon News, the official Nickelodeon Suites Resort Facebook page, Facebook.com/NickHotel has added some exclusive video clips featuring footage from the original Nickelodeon Double Dare series. Double Dare debuts on May 25th at the Nickelodeon Suites Resort! - This summer the Nick Hotel will unveil its' new LIVE show, Double Dare, in Studio Nick. Take the ultimate physical challenge and put your wits to the test in this goofy, fun, fast-paced, interactive game show. On Your Mark, Get Set, Go to the Nick Hotel's facebook page to see footage from the original Double Dare episodes. 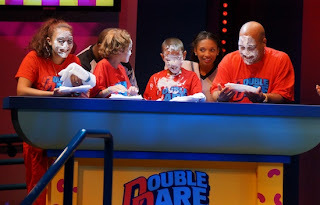 Studio Nick's modernized LIVE Double Dare combines the exhilaration of the Original Double Dare television show with our new twists and turns, provided by state-of-the-art technology, plus updated content incorporating pop culture like only the Nick Hotel can. Show your Nick fan pride and you might just be selected to be one of the eight lucky contestants. As a contestant, it's a race against the clock for your chance to compete in the famous final Double Dare Obstacle course. Pack your sun-glasses and head to the Nick Hotel for the vacation of your life! View our latest vacation packages today. On Your Mark, Get Set, Go! Nickelodeon Suites Resort has kicked off the summer with the addition of an old television game show favorite. Double Dare, an original creation of Nickelodeon, was one of the first fast-paced, fun, interactive game shows for kids. Studio Nick at the Nick Hotel has re-captured the thrills and the excitement of this one of a kind television show, allowing hotel guests to be “part of the act”. 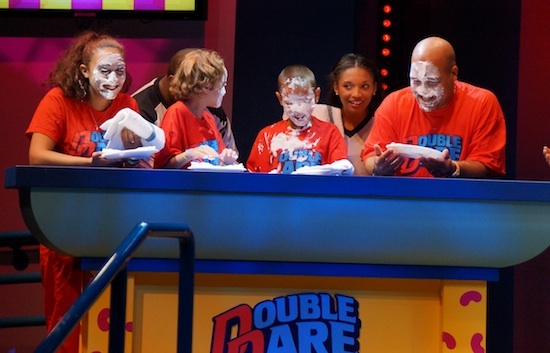 Studio Nick’s modernized live Double Dare combines the exhilaration of the original Double Dare with new twists and turns, provided by state-of-the-art technology, plus updated content incorporating pop culture. The hotel’s Studio Nick is transformed into the Double Dare sound stage. The stage is an updated version of the classic Double Dare set. Guests are recruited from the audience and earlier in the day at the hotel to compete in trivia and physical challenges. Eight players are selected to participate for the Blue Team or the Red Team (four each). Video screens will display trivia related to the 25 year history of Double Dare in a tribute to the original show. For more information, or to book a stay, visit NickHotel.com.